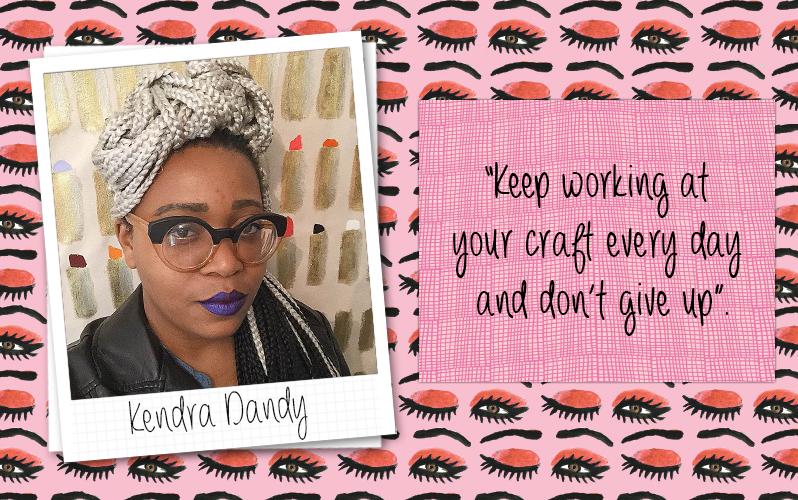 Kendra Dandy has certainly wowed us all with her quirky designs, fabulous patterns and vibrant colours in the Kiss and Makeup collection. Read on to find out what inspires her and what amazing brands she has already designed for! Tell us a little bit about yourself, do you have any hobbies? I enjoy art, dancing and vintage shopping. What brands have you designed for? I have always enjoyed art since I was little, and was glad to be able to find a way to make a career out of it. Do you like to follow trends or set trends? I like to do a bit of both, follow trends if I happen to like the particular trend, and set them when I want to do something different. I like acrylic paint, pastels, markers and watercolors. We love your fashionable and fruity drawings. What inspired you to draw these types of illustrations? I just draw whatever I like and take it from there. If you had to draw a famous celebrity/ or an important figure in history in your funky style, who would you choose? I would most likely do more pictures of Frida Kahlo. How would you use the Kiss and Makeup papercraft collection AND which is your favourite product from this line? I like the stickers the most and would probably put them on my computer and phone or maybe as part of a drawing. My favorite designer is Donald Robertson. I'm more into painting and drawing than crafting. I would pay off any student loan debts, buy a house and have money left for traveling. Such an inspiring woman and we couldn’t love her glamorous Kiss and Makeup collection more! Keep your eyes peeled for late March to pick up your own collection. Loving the Kiss & Make up range at the moment it's different.